Next up in our series, I talk to Tim Doull, who works on autographs for our products. These signatures make up some of the most popular content we have, not just on cards, but some of the remarkably cool and creative products released by Upper Deck Authenticated. But how do we collect these autographs anyway? 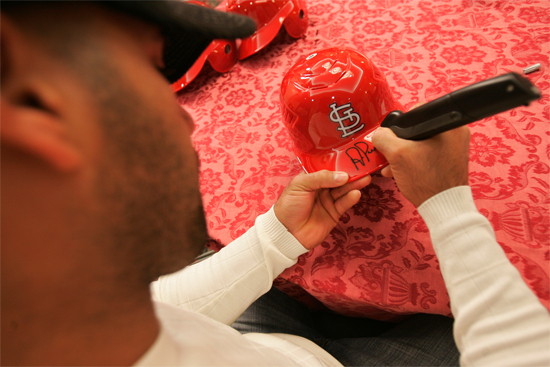 Our interview was actually delayed a week, because Tim had flown out to do a signing session with Albert Pujols. Once he got back, I was eager to hear about how that went, and what it’s like to work with so many top athletes in person. UpperDeckBlog: So what’s your official title? Tim Doull: Athlete Relations Manager. UpperDeckBlog: And that means autographs. Tim Doull: Yes. For memorabilia and trading cards. Anything autographed for all Upper Deck product lines comes through us. UpperDeckBlog: One thing I’ve seen from readers of the blog as we’ve picked up general sports fans is that people who haven’t followed the hobby for the last ten or fifteen years maybe weren’t even aware of autographs, or at least where they are now. What would you tell someone like that to catch them up? Tim Doull: The variations we do are really impressive, and you’d be surprised at some of the uniqueness. I mean you said ten or fifteen years ago, there was maybe one standard autograph every few boxes, pretty basic stuff. 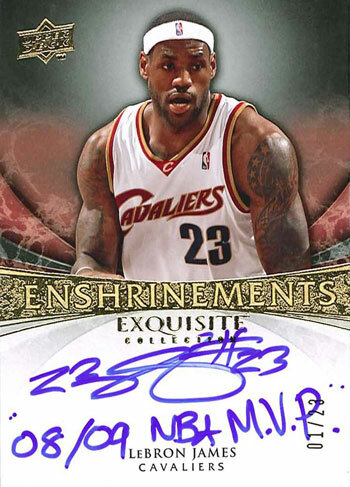 But these days, we specialize in the pen, we have them inscribe special cards sometimes, like with the LeBron 08-09 MVP card you posted to the blog a few months ago. We’re definitely trying to stay unique and give the collector something new. 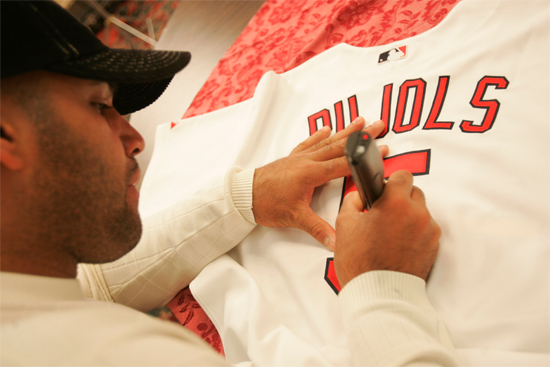 UpperDeckBlog: And you just got back from a Pujols signing last week! What was that like? Tim Doull: With all of the top tier athletes we partner with, it’s really special to work with their foundations and product lines. A lot of the guys are really vested in and care about what’s going into the market. In Albert’s case, he may arguably be the best right handed hitter to ever play the game when all is said and done. This year he’s probably MVP. We did the signing, and he hit two home runs the next day. It’s just really cool to be in the moment with these guys, and it’s something you can look back on, maybe tell your grandkids about it. UpperDeckBlog: And how does that go? You show up where the athlete is, and what happens next? Tim Doull: There’s a lot of preparation and rehearsal that goes into it. It’s a private setting, and we set everything up hours before he gets there, whether it’s memorabilia or trading cards. So when the athlete gets there, everything is ready. There’s nothing they need to do, other than to sit down and start signing. So our Athlete Relations team, we make sure to take care of everything. Due to busy schedules, the athlete may be late from time to time, but we’re always prepared in the event they come early. 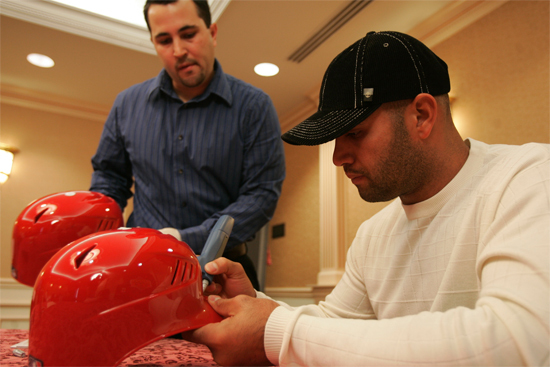 UpperDeckBlog: I’m sure a lot of collectors wonder what that’s like, I mean you’re sitting there watching Albert Pujols sign cards. Tim Doull: It’s a professional setting, so I’m not asking for pictures or going “Wow, what a hit last night!” They get enough of that from the media and fans. I try to relate more on music and entertainment, golf, or something not related to their sport that they might be interested in. UpperDeckBlog: Has there ever been one athlete where you couldn’t help yourself? Tim Doull: Well, there’s some cool access you get. Like the Lakers, you might get the whole team together in one private room after they’ve won the championship, and get to hear some of the banter that goes on between them in that moment. So that’s very cool. UpperDeckBlog: So once they sign the items, what happens next? Tim Doull: Well, we all wear white gloves and handle the cards very carefully, we check them for quality, organize and store them until it’s time for the product release. UpperDeckBlog: Do you have any cool personal stories about one of these signings? Tim Doull: Well, you take a guy like Tiger Woods, after winning the 2008 US Open in June of 2008. He was kind enough to give us something called a quick turn signing, three days after winning his 14 Major Championship. And just to see him limping around right after winning, before surgery, and to see the smile and glow on his face even though he was in pain, that’s definitely a great memory. Another unique story from the signings was gathering signatures for our 2008 Boston Celtics team championship product lines. We had Kevin Garnett, Paul Pierce, Ray Allen and others all in a room together signing. This was the first time some of the players were able to see images from the 2008 Finals games and you could see in their faces how proud they were of their accomplishments as a team. UpperDeckBlog: Is there anything you think an average collector might not consider when they open an autograph in a pack, in terms of how it gets there? Tim Doull: If you look at it from the athlete’s perspective, penmanship is something to mention. A lot of autographs you’ll see elsewhere look like a squiggle, or just a line. But most of our autographs, especially our exclusive partners, they take the time to give you a legible autograph. It’s great that they can be consistent, and give you a solid autograph every time. Something else the average collector may not consider is the time commitment it takes for the athletes to sign. Outside of game days you can expect players in all sports to be regularly signing cards to hit our product release deadlines. They do their best to meet our dates even if it means signing during a playoff run, between playoff series’, or maybe they just had a child, etc. We focus a lot on quality, like changing out pens constantly during a session to keep it fresh. We want to try and make sure every collector gets the same autograph, so we pay attention to details. UpperDeckBlog: Anything else you’d want to add? Tim Doull: I think one really unique thing we’re doing now is the inscriptions, like the LeBron card. We’re starting to think a bit outside the box with more items like that. UpperDeckBlog: It sounds like a bit of evolution there, giving the customer something extra and unique, because they’re demanding more than just standard autographs. Tim Doull: Yes, and I think the cards themselves have really evolved too. If you’re just coming back to the hobby, you should pick up a few packs and see what we have to offer. Autographs, game-used memorabilia, all kinds of added value and we’re always coming up with new ideas.